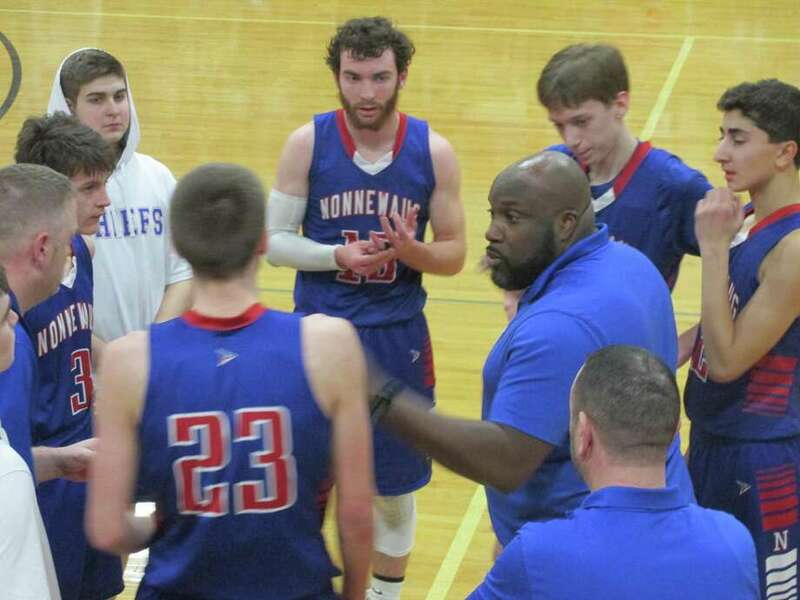 Nonnewaug coach Devonne Parker and star Jarrett Michaels, center, led the Chiefs to a win at Northwestern Monday night. “We rebounded better; we played better as a team; we had better ball movement; and we closed on their three-point shooting a lot better,” said Nonnewaug star Jarrett Michaels, whose 17 points was a team-second to J.D. Gengenbach’s 21. “In the first game, (Gengenbach) didn’t score,” said Northwestern coach Doug Sebach. Credit ball movement and sharp passes from Michaels for much of that individual difference as the 6-foot-2 Gengenbach feasted for eight layups against the Highlanders’ taller front line. “(Michaels) is Mr. Everything for me, on offense and defense,” said Nonnewaug first-year coach Devonne Parker, who studied film of the first game to work out a defensive scheme cutting off passing lanes for Michaels’ Northwestern counterpart, Levi Delaney. That left Delaney (team-high 17 points) as a one-man show in many of his attempts to get to the basket Monday, despite a big assist from hard-working Highlander forward Trent Valliere (12 points) underneath. Northwestern’s outside shooting was a factor in the first game, back in December. Not Monday. Almost rubbing it in, Nonnewaug sophomore Jon Khazzaka (10 points), off the bench in the third quarter, buried his second 3-pointer in the period’s final minute, pulling Nonnewaug back to a 37-33 lead after the Highlanders pared a 27-16 halftime lead down to a single point. From there, the Chiefs (9-3; 8-3 Berkshire League) used the same improved formula that earned a 13-10 edge at the end of the first period and their half-time bulge. Gengenbach scored the fourth quarter’s first six points on a put-back and two layups assisted by Michaels. With Nonnewaug’s lead back 10, the Highlanders (6-8; 5-7 Berkshire League) weren’t coming back again. J.D. Gengenbach 8-5-21; Jarrett Michaels 7-2-18; Jackson Baker 0-2-2; Colby Steinfield 1-3-5; Jon Khazzaka 3-2-10; Tyler Lindberg 1-0-2; Ryan Tomkalski 1-0-3; Totals: 21-14-61. Levi Delaney 4-7-17; Colin Wilson 1-0-2; Trent Valliere 5-2-12; Brandon North 2-0-5; Joe Ogonoski 2-1-5; Totals: 14-10-41. 3-point goals: N — Michaels 2; Khazzaka 2; Tomkalski. NW — Delaney 2; North. Records: Nonnewaug 10-3; 9-3 Berkshire League. Northwestern 6-8; 5-7 Berkshire League.